DNG Maxwell Heaslip & Leonard receiving the award for Best Office Nationwide 2018. Pictured are Adam Ferguson, Daft.ie; Alan Maxwell and James Heaslip of DNG Maxwell Heaslip & Leonard; and Paul Newman, chairman DNG. 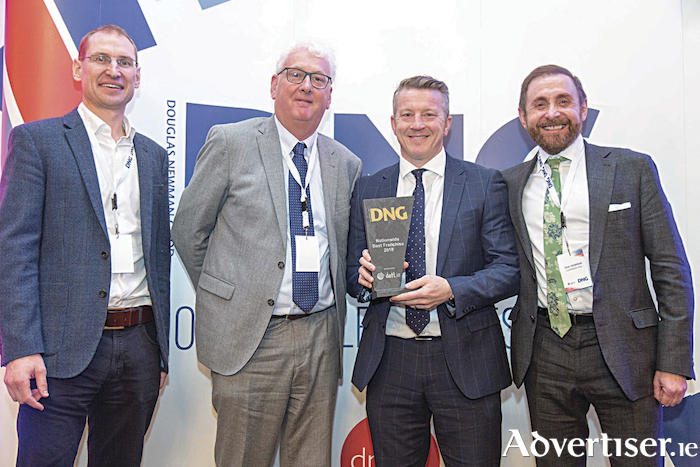 Galway city estate agent DNG Maxwell Heaslip & Leonard has received the 2018 DNG Franchise of the Year award at the DNG National Conference, which took place in the K Club last Friday. The annual awards event was attended by more than 60 offices, with the awards being based on standards of service, business acumen, and professionalism. DNG franchisees are renowned as leading agents around the country and, coupled with an extremely strong Dublin presence, they are the major force in the Irish residential market. With more than 200 in attendance, the delegates met to discuss the future of the property market, their role in the residential sector, and a host of innovations connected to the residential property market. A key factor in winning this prestigious award was the company’s high ratings in customer service levels. Mairead Leonard said: “We offer a dynamic professional service that is second to none. As well as our residential sales division, we have a strong presence in the new homes market, with a number of developments already under way. Our commercial arm is going from strength to strength, and our lettings team operate one of the largest rental business in the west of Ireland. We use cutting edge technology and innovative marketing in all its forms to deliver the best service in the marketplace. Since the last downturn, the hectic pace of the market meant that service levels were impacted, so we have always tried to train our team to focus on the customer and their wants. This award is a credit to all our dedicated staff, who always adhere to the highest standards of excellence, and it's because of them we have won this accolade." DNG Maxwell Heaslip & Leonard offers the complete range of services including residential sales and lettings, valuations (bank, probate, legal, etc ) and commercial sales, lettings, and rent reviews.